Biking routes around the city are all very well, but at some point you need a place to park your trusty vehicle. Christchurch is proving generally pretty good at rolling out more public bike parking with every new street or land-use development, although there still some locations where there never seems to be enough spaces handy. 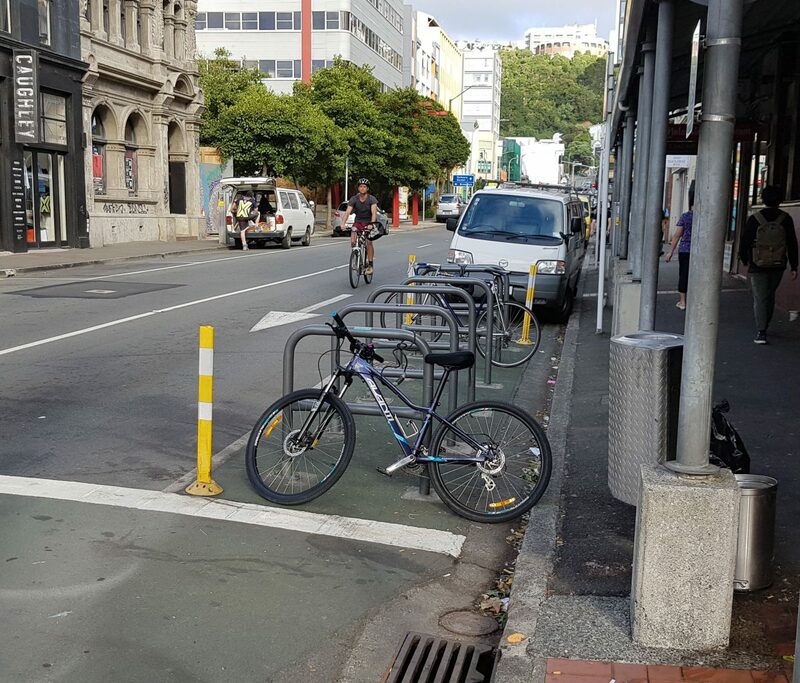 This treatment is often known as a “bike corral”, originally popularised in Portland, Oregon, where they are in great demand by local retailers. As you can see, the equivalent of one car park space can hold up to ten bikes in the same area; posts and small kerb-stops are often used to protect the area from errant motorists. It’s not surprising that many retailers, especially in the hospitality industry, are keen on these outside their premises; they can do the numbers and see that a lot more potential customers can fit here on their bikes compared with those bringing their cars (this photo was taken early in the morning by the way). I’ve wondered why we’re a bit slow to introduce a few bike corrals around Christchurch. As you can see, Wellington is already into it in a few locations, I saw one (as a moveable ‘parklet’) in Palmerston North last year, and Auckland’s had one for over five years. Certainly I can think of a few places around Christchurch that could benefit from one (including a certain pub not far from where I work…). If we’re not sure about the relative success of a location, perhaps we should look at moveable bike corral parklets that can be temporarily installed to test the concept. 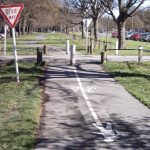 Should we have some bike corrals in Christchurch? Where? Moveable seems a good idea, suggest a hollow frame that can be filled with water making it hard to move, but more environmentally friendly than most other methods. Twisted Hop has bike parking at the back. Not sure about Pomeroys or The Brewery at the Tannery – there is a theme to the pubs I like…. Next Next post: Guest Post: Are the Demographics of Cyclists Changing?